Hard drive recovery from scored platters used to spell death for recovering data. 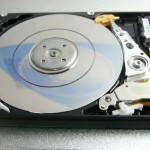 DTI Data Recovery has special techniques to recover damaged hard drives, specifically from scored platters. A hard drive can get scored platters when the heads impact the platters. This happens when a hard drive is dropped, stops suddenly due to power failures or from heads failing. The video below shows some of the techniques DTI Data Recovery uses to recover data that others will deem unrecoverable.